First Line: This would be his first murder, and he hoped it would be his last. Genealogist Jefferson Tayte's client has an interesting ancestor. Every record Tayte can find insists that this ancestor drowned one hundred years ago when the Empress of Ireland sank to the bottom of the St. Lawrence River; however, his client's very existence proves that can't be true. He has to get to the bottom of the mystery, and the bottom is in England. Tayte's search will have him uncover secrets buried before the beginning of World War I, and-- once again-- he's going to be a part of an investigation into murder. Who says researching family history is dull? As in his previous book To the Grave, author Steve Robinson tells his story with two narratives; one in 1914 and Tayte's in the present day. It is a technique he does well. I found both narratives to be equally interesting, and both kept me guessing at how all the pieces fit together. 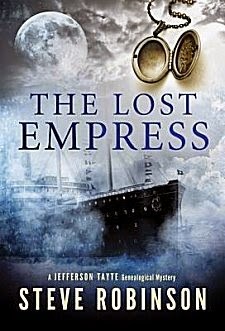 In addition, Robinson shines the spotlight on an almost forgotten tragedy: the sinking of the Empress of Ireland. With a death toll almost as high as the Titanic, the Empress of Ireland has long been overshadowed by the Titanic, the sinking of the Lusitania, and by the beginning of World War I. The Lost Empress does deal tangentially with the Great War and its centenary this year by focusing on some of the events that led up to it. This strong historical foundation adds a great deal to the past narrative in the book. Another thing that Robinson has done throughout this series is vary the action. From someone who blundered from one concussion to the next in the first book, Tayte has become calmer and more assured-- even to the point of dodging bullets in The Last Queen of England. Robinson knows that there aren't many genealogists out there who dodge bullets for a living, so there's no repeat of that in this book. Instead the focus is on that very puzzling ancestor and her story, and it's a very rich and satisfying mystery to solve. This book can easily be read as a standalone, but as the story ends with Tayte being on the verge of making a life-changing decision, chances are excellent that this is one series you're going to want to continue following. Oh, I do like the JT series, Cathy. O f course, I'm a sucker for a novel that blends history with a modern-day murder. And genealogy really is interesting. Glad you liked this. I'm so glad to hear you're another fan, Margot! I'm not familiar with this author or series, but it sounds fascinating.